Casella's Airwave App provides remote access of noise dosimeters and personal air sampling pumps. The Airwave App provides remote access of noise dosimeters and personal air sampling pumps. 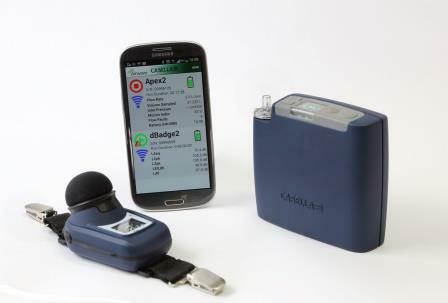 Available for download on both Android and iOS devices, Casella’s latest products—including the Apex2 personal dust sampling pump and dBadge2 personal noise dosimeter—are supported by the Airwave App. The Airwave App enables users to remotely start, pause, or stop a measurement run, monitor battery life and memory capacity, and check measurement progress direct from a mobile device, without having to disturb the worker, improving productivity levels. Data can be emailed alongside photos and notes, adding context to the data and further simplifying the reporting process. This remote access facility makes monitoring and the collection of data much easier. The Apex2 personal sampling pump range allows accurate and reliable monitoring of exposure to dust in a variety of industrial workplaces. The product range includes the Apex2, Apex2 Plus and Apex2 Pro, all featuring different functionality to meet varying requirements. The dBadge2 personal noise dosimeter measures every possible noise exposure related parameter during a measurement run. With the information available for subsequent download and analysis, it ultimately allows the industrial hygienist to assess risk or recommend control measures.